Ibuprofen is a non-steroidal anti-inflammatory drug frequently administered to children of various ages for relief of fever and pain and is approved as an over-the-counter medication in many countries worldwide. Although there are extensive data on its efficacy and safety in children and adults, there are divergent dosing recommendations for analgesia and treatment of fever in infants, especially in the age group between 3 and 6 months of age. 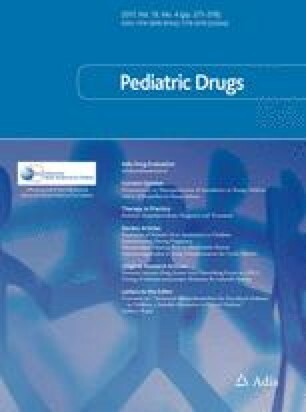 In this article, we have assessed the safety and efficacy of ibuprofen use in infants in an attempt to find the optimal method of pain and fever management in this specific age group. Based on the current evidence, short-term use of ibuprofen is considered safe in infants older than 3 months of age having a body weight above 5–6 kg when special attention is given to the hydration of the patient. Ibuprofen should be prescribed based on body weight using a dose of 5–10 mg/kg. This dose can be administered 3–4 times a day resulting in a maximum total daily dose of 30–40 mg/kg. The rectal route has been shown to be less reliable because of erratic absorption, especially in young infants. Since most efficacy and safety data have been derived from trials in infants with fever, future studies should focus on the efficacy of ibuprofen in young infants with pain. All authors (VCZ, AZ, TOE, JNvdA) declare that they have no conflict of interest. This work was supported by National Institutes of Health grants from the Eunice Shriver National Institute of Child Health and Human Development (5T32HD087969 & 5U54HD090254) to John van den Anker. Reckitt Benckiser Deutschland GmbH. Fachinformation Nurofen Junior Fieber- und Schmerzsaft Erdbeer 40 mg/ml Suspension zum Einnehmen. 2015 January 2015 [cited 2016 December 21, 2016]; Available from: http://www.nurofen.de/media/922462/Nurofen-Junior-125-mg-Zaepfchen_Januar_2015.pdf. Reckitt Benckiser Healthcare (UK) Ltd. Nurofen for Children Orange Baby/Nurofen for Children 3 months to 9 years. 2014 October 2, 2014 December 21, 2016. Available from: https://www.medicines.org.uk/emc/medicine/23381. Reckitt Benckiser Healthcare (UK) Ltd. Nurofen for Children Strawberry/Nurofen Strawberry 3 months to 12 years. 2014 October 2, 2014 December 21, 2016. Available from: https://www.medicines.org.uk/emc/medicine/20096. Deputy Division Director Review—NDA 22348 Supplement 005—Caldolor pediatric indication—Reference ID: 3849398. 2015 November 19, 2015 [cited 2017 January 11, 2017]. Available from: http://www.fda.gov/downloads/Drugs/DevelopmentApprovalProcess/DevelopmentResources/UCM480294.pdf. Vifor Consumer Health SA. Fachinformation Algifor® Junior. 2012 August 2012 [cited 2016 December 21, 2016]. Available from: http://www.swissmedicinfo.ch. Study Report for Study 573-CHC-9127-001 - Open Label Pharmacokinetic Study of a Single Dose Ibuprofen Suppository in Children with Fever. 2003 December 05, 2003 [cited 2017 January 11, 2017]. Available from: http://art45-paediatric-studies-docs.ema.europa.eu/GROUP%20I/ibuprofen/ibuprofen%20573-CHC-9127-001.pdf.